Added on 22 November 2018 . By Anisah Audu. Ho ho ho-ld up... this ain't your average mince pie. The Christmas lights have been switched on, we're writing our lists to Santa (just me?) and the festive menus are out in full force. But not all is as it seems, because Cinnamon Bazaar have something special up their sleeves. 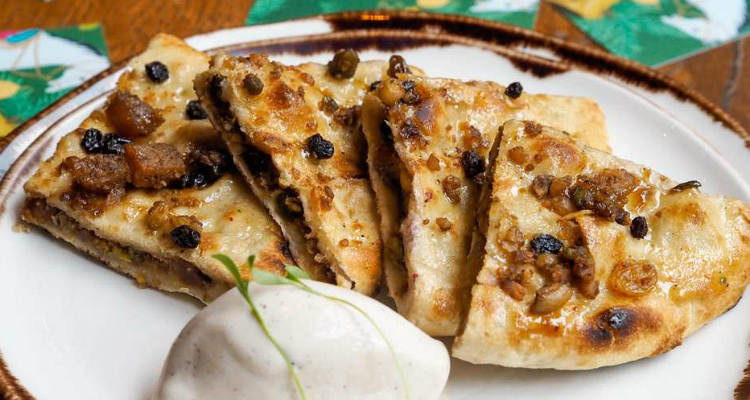 Serving up London's first ever Garam Masala mince pie naan, the Covent Garden restaurant is proving just how innovative their Indian dishes are. Marinated in dark rum, brandy and red wine for six months, the limited edition treat is then filled with fruits, nuts and spices for the perfect boozy and buttery winter warmer. Cinnamon Bazaar's Garam Masala mince pie naan costs £6 (£7 with cream) and is available now. Find it at 28 Maiden Lane, WC2E 7JS until the end of December.